Forgive me father for I have sinned, it's been ten days since my last Ashtanga practice. Oops, Ashtanga police will be on my tail and it seems this week they're armed. Despite picking my Vinyasa Karma practice back up in the mornings I'd intended to keep my Friday Primary and at least one Intermediate practice. I mean, I never miss Friday Primary, not unless I'm really sick and even then I force myself through it the Saturday. For some reason that's not the case this week, skipped Primary on Friday, Intermediate on Saturday and not sure I'll practice them this weekend either. I wonder if that's one of the reasons I've struggled to let go of my Ashtanga practice, despite focusing on Vinyasa karma I've always kept that Friday Primary, kind of like staying 'best friends' with an exgirlfriend, bad idea (most of the time). So Ramaswami's Newsletter came out this week, a nice, juicy asana one. 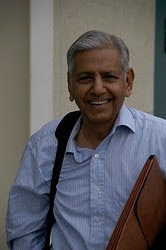 Ramaswami outlines a whole bunch of spinal exercises which I preceded to turn into a practice the very morning the newsletter arrived. Might be a bad Ashtangi but I'm a good Kramite this week. I liked it so much I've practiced it all week, tweaking a bit here a bit there, shifting first this bit around and then that. I don't think Ramaswami intended the exercises he mentioned as a stand alone practice but it works and it makes for a nice practice. 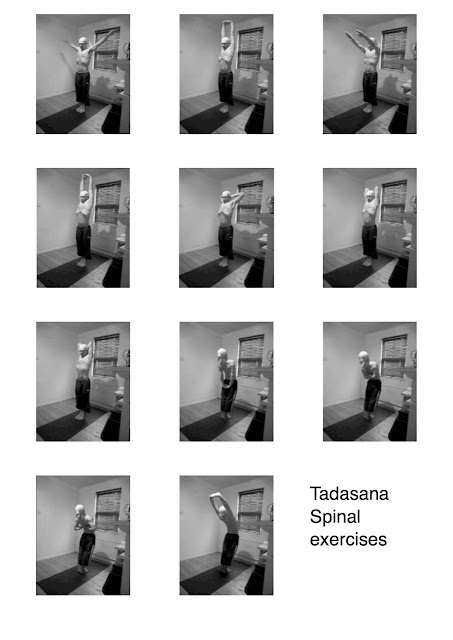 Basically I'm starting off with the short tadasana sequence as usual emphasising the lift out of the hips and the light backbend hand variations. After a couple of Sury namaskaras ( still the best all round warm up for my money) I do a little standing, some Triangle and On one leg vinyasas, these have changed a little every day. For the main body of the practice I've settled on starting with the Supine postures, the Dwipadapitam (table) and Purvotanasana subroutines. 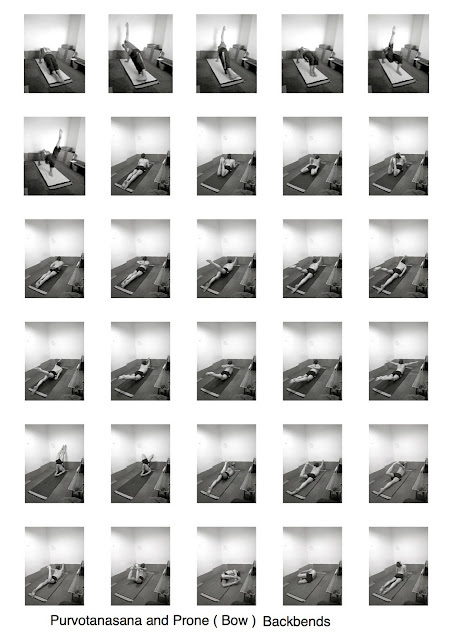 I tend to neglect Supine sequence a little, I think that's why I've enjoyed revisiting it so much this week. I figured these were gentle backbends and led nicely into the more direct prone postures of the Bow sequence. Usually I'll go ahead and do Viparita salabhasana and Gandha Bherundasana before moving on to a kapotasana subroutine from Meditative sequence but for some reason I decided to keep it a light practice this week. After Bow I used paschimotanasana and vajrasana vinyasa as counter postures. At first I started with Vajrasana but later in the week did a long paschimottanasana first and then part of the Vajrasana routine. There's less support for the back in the Vajrasana forward bend so it seemed to make sense to do paschi first. Then it was on to finishing as usual, long inversions. That was basically the practice although I'm including a little advanced hip opening work after the inversions. This is something extra, basically maha mudra, janu sirsasna C, Viranchyasana B then a deep deep badha konasana and some working towards kandapidasana, then gomukhasana as a kind of counterpose before slipping into Lotus for yoga Mudra and on into pranayama and meditation. I'm doing that routine in my evening 20/20/20 practice as well. I made up a couple of sheets to illustrate Ramaswami's newsletter for the Ashtangi's on the other blog, who perhaps don't have access to his book. I thought I'd use them here to outline the running order of how I've been approaching practice this week. It just covers the main spinal exercises Ramaswami mentioned, you'll need to add in your own Standing postures and then the inversions at the end. ....and so to practice. The plan this morning is pretty much the same as above but being my day off I can explore some of the other Supine vinyasas, a few more repeats and some longer stays perhaps. Thanks Tony. This reminds me that I think VK is more like a subject. 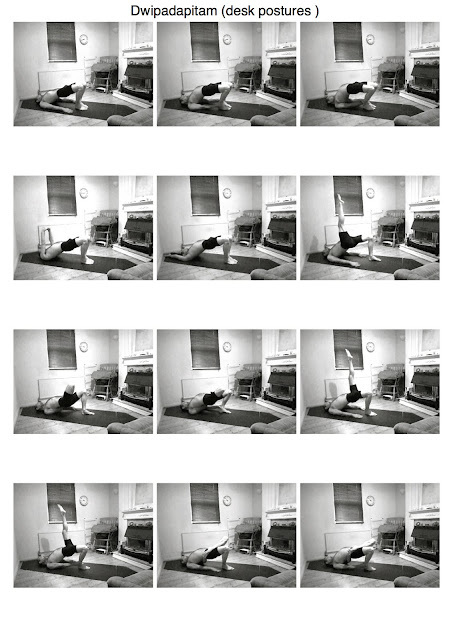 there is so much versatility, it seems to be less about the particular asanas, and more about the collective practice. I am doing one long practice in the morning which pulls a bit from each sequence, then I practice a particular sequence later in the day. I like practicing twice a day. VK healed me, an I am back If not even better than before. Glad to hear you are really into VK for the time being. BTW what is the picture?!!! I agree Wyatt, I find I think more in subroutines than postures now, even groups of subroutines. Twice a day makes a difference, like how Ramaswami suggested working on postures your finding a challenge in the evening/2nd practice. And again it's subroutines, you lead into a posture with prep postures and then some counter postures. i do Gomukhasana (cows face pose) after the kandapdasana work to kind of relax the hips back.